Background: Postprandial hyperglycemia can be reduced by inhibiting major carbohydrate hydrolyzing enzymes, such as α-glucosidase and α-amylase which is an effective approach in both preventing and treating diabetes. Objective: The aim of this study was to synthesize a series of 2,4-dichloro-5-[(N-aryl/alkyl)sulfamoyl] benzoic acid derivatives and evaluate α-glucosidase and α-amylase inhibitory activity along with molecular docking and in silico ADMET property analysis. Method: Chlorosulfonation of 2,4-dichloro benzoic acid followed by reaction with corresponding anilines/amines yielded 2,4-dichloro-5-[(N-aryl/alkyl)sulfamoyl]benzoic acid derivatives. For evaluating their antidiabetic potential α-glucosidase and α-amylase inhibitory assays were carried out. 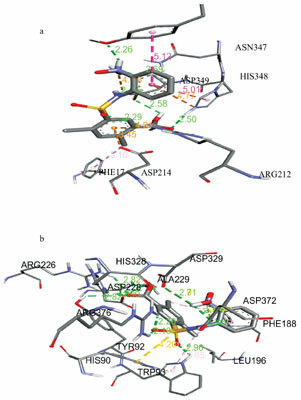 In silico molecular docking studies of these compounds were performed with respect to these enzymes and a computational study was also carried out to predict the drug-likeness and ADMET properties of the title compounds. Results: Compound 3c (2,4-dichloro-5-[(2-nitrophenyl)sulfamoyl]benzoic acid) was found to be highly active having 3 fold inhibitory potential against α-amylase and 5 times inhibitory activity against α-glucosidase in comparison to standard drug acarbose. Conclusion: Most of the synthesized compounds were highly potent or equipotent to standard drug acarbose for inhibitory potential against α-glucosidase and α-amylase enzyme and hence this may indicate their antidiabetic activity. The docking study revealed that these compounds interact with active site of enzyme through hydrogen bonding and different pi interactions. Keywords: Sulphonamide, α-glucosidase inhibitor, α-amylase inhibitor, antidiabetic, docking, ADME properties. Keywords:Sulphonamide, α-glucosidase inhibitor, α-amylase inhibitor, antidiabetic, docking, ADME properties. Abstract:Background: Postprandial hyperglycemia can be reduced by inhibiting major carbohydrate hydrolyzing enzymes, such as α-glucosidase and α-amylase which is an effective approach in both preventing and treating diabetes.